Property Size 2,658 sq. ft. This gorgeous, spacious home, has tall ceilings, flat screen televisions, and the nicest pool deck you can find which also has a beautiful nature view. 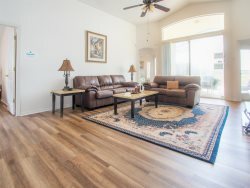 6 Bedrooms/3 Bathrooms Home with Private Screened Pool, Hot Tub, Conservation View, Gameroom, Pet Friendly, Master Suite, King Bed, Soaking Tub, Washer/Dryer, Fully Equipped Kitchen, Free Wireless Internet, Expanded Cable, Close to Disney. Pool, Spa, Five Sun Loungers, Two Tables, Eight Chairs, Shaded Lanai, Conservation Area, Southern Exposure. The community is located just a minute or two from either a Publix full service grocery or super Wal-Mart and 24 Hour Pharmacy/Sundry shop. There are also many restaurants from fast food to fine dining, home improvement stores, mini-golf, Sam's Club, Costco, BJ's, and numerous other quaint attractions very close by. A Disney entrance is only 12.5 miles away. Sea World, Universal, and the Convention Center are approx. 15 minutes beyond that. Very beautiful home and had everything we needed. We had kids, teenagers and adults staying here and there wasnt a time were someone was bored. Will be booking the same house when I vaction here again 5 stars! Once again, a very relaxing and enjoyable stay with Dream Homes. 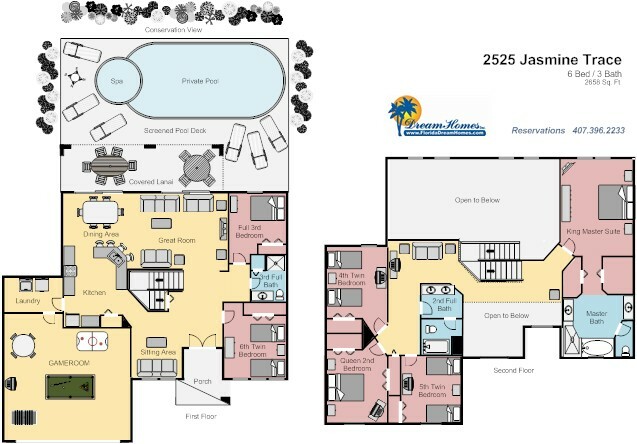 We were at 2525 Jasmine Trace for the second year in a row, and found it the place to be to relax in the pool and spa, or just watch some TV....or take a nap :) . This was our 5th time staying with Dream Homes, and we tell everyone we talk to the check it out if going to Florida. We tell them why be cramped into a hotel room with one bathroom, when you can have multiple bedrooms and bathrooms, and your very own private pool, spa, and game room. :) We want to personally thank Lance and Karin for checking out the hot water heater when we arrived on a Sunday. Lance got the very minor problem corrected in a matter of minutes, and we were in business for hot showers after a very long drive from Kentucky. Looking forward to our next visit with Dream Homes!